I know what you’re thinking. Probably something along the lines of: gosh, I really hope Molly has barred Debbie Downer from writing any more posts about economic meltdowns and national crises… on her food blog. And yes, I admit my last post was a bit depressing, but I can assure you that I am in quite a better mood on this beautiful Sunday. I haven’t even heard from Debbie in days. To prove it, I will speak nary a word about under-appreciated employees today. No, today I’d like to focus on something entirely different: under-appreciated baked goods. Specifically, scones. I don’t mean to imply that you don’t appreciate the gustatory treat that is a scone. I know you, dear reader, are much smarter than that. I just mean that, up until recently, I didn’t fully appreciate the scone as a legitimate member of the baked goods family. For shame. But really, can you blame me? For years I grew up frequenting the local Starbucks thinking that a scone was nothing more than a stale, hulking brick of heavy dough laden with cinnamon and sugar and, mostly, an ungodly amount of calories. Whether the plan was to ingest them or use them as projectile weapons, those “scones” sitting in the glass counter looked dangerous. I kept my distance and pretty much wrote off the concept of scones entirely. Until about two summers ago, when I found myself on a family trip to Ireland. Feeling adventurous, we signed up for a biking tour of Ireland’s west coast, and spent about a week biking through the hilly Irish countryside. Aside from perpetually sore backsides and the decision my sisters and I made to wear matching green raincoats (I still wear mine, obviously), the trip was amazing. We biked along winding roads flanked by charming, low rock walls, through colorful fishing towns and farmland full of cows and sheep, stopping here and there to take pictures or browse local shops for postcards or a bite to eat. We also took a ferry over to the Aran Islands for a one night stay at a little Inn that was so positively charming that I cannot for the life of me remember its name. (Mom, if you’re reading this, help a kid out.) In any case, I do remember that the proprietor of this nameless Inn was a very sweet woman who made fantastic scones. When we arrived, exhausted from biking a few miles from the port to the Inn against a strong sea wind, she gave us a quick tour and told us that, if we woke up early enough the next morning, we could come watch her make the day’s scones in the kitchen. I promptly went to bed and forgot about the whole thing, still being in a generally anti-scone state of mind. But the next morning, as I sat down to breakfast and was passed a plate of freshly baked Irish scones, I couldn’t say no. These scones didn’t look a thing like the huge coffee shop bricks I was accustomed to. These were small and hot and golden, and smelled enticingly of fresh butter and flour. I slathered the flaky round with butter and honey, and when I finally took a bite, I was not disappointed. I mean, I was disappointed that I had missed out on 21 years of scone-eating, but this nameless Inn scone was the opposite of disappointing. It was warm and flaky and only slightly sweet and, combined with freshly brewed Irish breakfast tea, tasted how I imagine Sunday morning would taste. I’m still kicking myself for missing the Aran Island scone-baking demonstration, but at least now I can appreciate the scone for all it’s worth. I recently found a recipe by M.S. Milliken and S. Feninger for buttermilk scones, and when last week’s lemon olive oil cake left me with half a carton of buttermilk sitting in the fridge, I knew exactly what to do. There’s not much that the creamy tang of buttermilk doesn’t enhance, and these little guys are no exception. The tang of the buttermilk combined with the sweetness of the berries gives these scones a wonderful balance. They’re not overly sweet or rich, but are light and doughy and loaded with pockets of jammy fruit, and would make a lovely breakfast smeared with butter and eaten with a mug of hot coffee or tea. Mine were devoured by a troup of hungry thespians during the final dress rehearsal for Gypsy, but you know… to each her own. Feel free to omit the berries or play around with other versions (dried or candied fruit, nuts, or even chocolate chips, if you’re feeling a bit devious). Preheat oven to 40o degrees F. Combine the flour, sugar, salt, baking powder and baking soda in a large bowl. Cut in the butter with your fingertips or two knives until the mixture becomes a coarse meal. Add the buttermilk and mix with your hands until just combined. Add the berries (still frozen), pressing lightly to incorporate into the batter. Dump the dough onto a floured board and roll out until about 3/4 inch thick. This will be a very messy job – just make sure you keep flouring your rolling pin so the dough doesnt stick (and try not to be dismayed by the berries that will inevitably free themselves from the sticky dough and roll onto the floor). Using a round cookie cutter or the mouth of a small glass, cut out rounds of dough and place slightly separated onto a greased baking sheet. Brush the tops with milk or cream, sprinkle with a bit of sugar, and bake for 15 minutes, or until lightly browned. Serve warm, plain or topped with butter and jam. 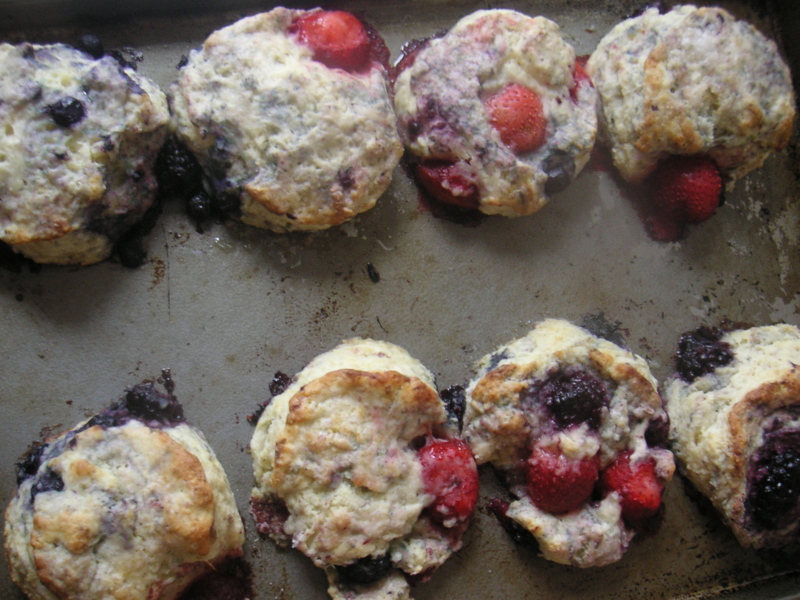 Makes 16-18 buttermilk berry scones. yum! the only thing you are missing is clotted cream and fresh lemon curd…but maybe those are exclusive to british scones? regardless..they look delish! That must have been an amazing trip. And your scones look amazing, too!